Nikia Leopold is author of Once I Was (1999) and K is for Kitten (2002): The first of the two books is a poem which helps young readers overcome day-to-day challenges. For instance, a girl in the poem tell us that "I used to be afraid to swim / Now I am a mermaid / Once I couldn't comb my hair / Now I make a braid." 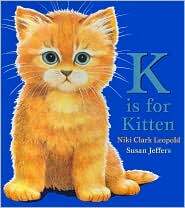 Leopold's second book is an alphabet book which tells the story of Miss Rosie, a rescued kitten. The book's rhymes describe Miss Rosie's adventures from falling into the pond to going to the vet. Both of Leopold's books are beautifully illustrated and perfect reading for preschoolers.